It’s National Picture Book Month, so we’re celebrating picture books–both fiction and nonfiction! Nonfiction picture books are a truly exceptional–and often overlooked–way to introduce a subject or person. Even to grown-ups! We’re particular fans of picture book biographies, and they appear on our booklists regularly. 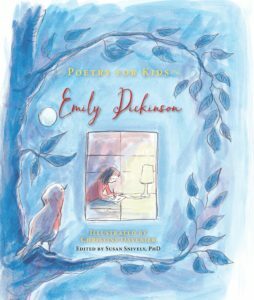 Poetry for Kids: Emily Dickinson. 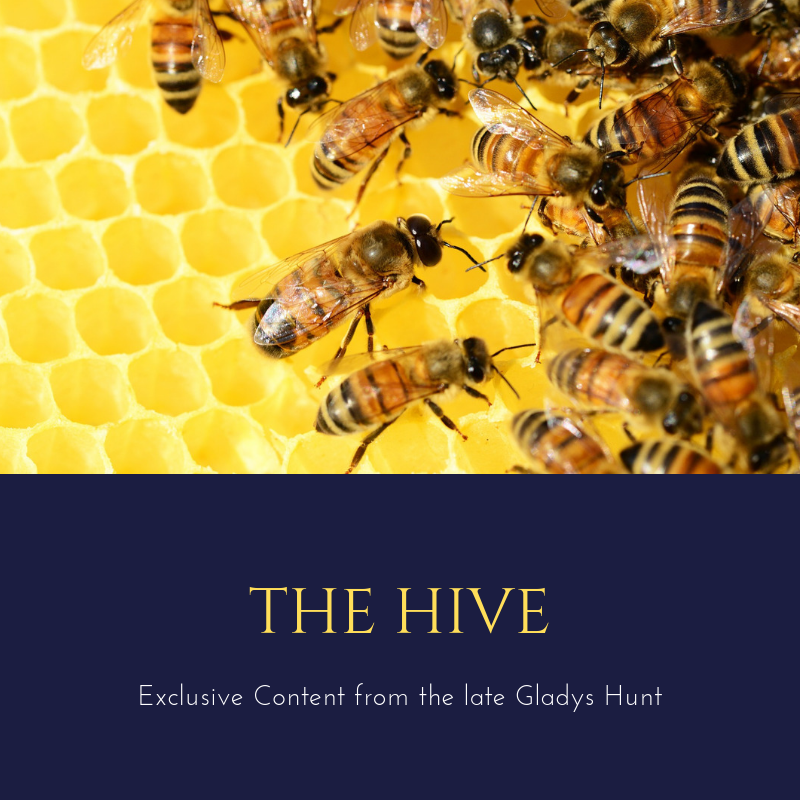 (2016) We’ve mentioned the Poetry for Young People series before, but this is a different series (albeit similar). Like the Poetry for Young People series, Poetry for Kids tackles a different poet in each volume, matching each poet to a different illustrator. Illustrations in the volumes we’ve seen (such as this one on Emily Dickinson and the one on Walt Whitman) are lovely and childlike. Up-to-date stylistically while still feeling “classic,” the illustrations really add to the child’s enjoyment of the poetry. A kid-friendly introduction to the poet’s life, solid selection of poems, and brief explications of poems chosen make this a terrific first book about the poet and his/her works. Ages 4+. Karl, Get Out of the Garden! 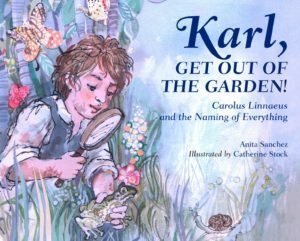 : Carolus Linnaeus and the Naming of Everything by Anita Sanchez and illustrated by Catherine Stock. (2017) Linnaeus gave us our scientific naming system–why we have homo sapiens, canus familiaris, and so forth. Before his simple approach, scientists had no unifying system and talked in circles about their new discoveries much the same way colloquial terms today call the same insect “firefly” or “lightning bug.” But Linnaeus didn’t spring onto the scene a fully grown man; this biography takes the reader back to his childhood and his love of careful observation. Sanchez’s text highlights Linnaeus’s love of nature, order, and specificity, and includes Linnaeus’s own words frequently: “Find wonder in everything, even the most ordinary.” The exuberant illustrations seem a little out of place given this love of precision. Nonetheless, this is a fine introduction to an important scientist. Ages 6 and up. 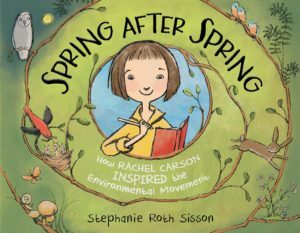 Spring After Spring: How Rachel Carson Inspired the Environmental Movement by Stephanie Roth Sisson. (2018) Before Carson’s Silent Spring caused people to wake up and smell the flowers, she was quietly observing the world around her spring after spring. Students who practice nature study today will recognize similar habits in Rachel Carson’s life; the reason her book is called Silent Spring is because one spring, she noticed a lack of birdsong (compared with previous years). This launched her investigation into the causes. An attitude of stewardship is very different that one of worship, and we do well to help our children sift through those murky waters. Regardless of your opinion about the modern environmentalist movement, Carson’s example of paying attention to God’ creation and our impact on it is a good one. Ages 4+. Meisel, Paul. My Awesome Summer by P. Mantis. Holiday House. 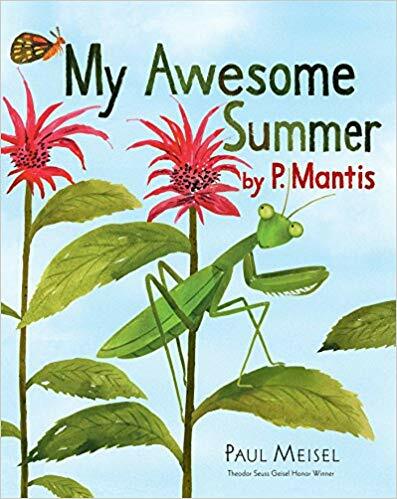 (2018) Haven’t you always wanted to read a praying mantis’s diary? Well, here you go! Remarkably literate from birth but not overly verbose, P. Mantis introduces her remarkable life in a delightfully engaging way. What happens to her 150 brothers and sisters who share her birthday? What does she do when a predator comes near? How often does she need to shed her skin? What happens at the end of the summer? She’s so warm and friendly, it’s easy to see why praying mantises are such fascinating insects. Warm, vibrant illustrations with a little bit of hide-and-seek to find Miss Mantis make this book a treat for the eyes. Further fascinating facts are found on the inside covers. Raschka, Chris. Paul Writes a Letter. 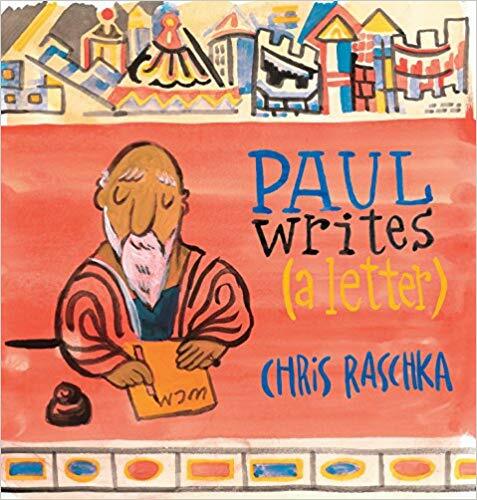 (2018) Brightly illustrated, in epistolary form with Scripture references, this is a very minimal introduction to Paul as a letter-writer. Raschka attempts to highlight prominent features of each letter to the churches, but sadly misses the heart of the gospel which was Paul’s driving passion. Several individuals are mentioned, but there are curious omissions, such as Onesimus in the book of Philemon. It was not philosophical adherence to teachings of good works that inspired Paul to write these books and die for his faith; it was the work of the Holy Spirit filling Paul with joy and love for His Savior, breathing Truth and sound doctrine for “instruction in righteousness.” I wish Paul’s convictions had been more clearly expressed in this attractive picture book. You would be better off reading the original epistles. 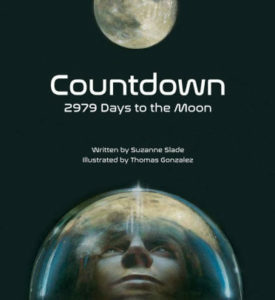 Countdown: 2979 Days to the Moon by Suzanne Slack, illustrated by Thomas Gonzales. (2018). President Kennedy’s call to “go to the moon before the decade is out: probably got a boost from his untimely assassination, but it wasn’t until 1967 that the preliminary work was out of the way and Apollo I sat on the launch pad for a practice countdown. But tragedy struck when a spark from a frayed wire ignited the oxygen-filled cabin–three astronauts lost before a moon rocket even left the ground. But not one suggested shelving the program, and each Apollo mission after pushed a little closer to the goal. In July 1969, Apollo 11 lifted off for its ultimate mission: to leave a human footprint on the moon. The story gets full-page, oversize treatment with each mission outlined in blank verse. Chapters end with biographical sketches and photos of the mission, but the rest of the illustrations are lavish full-color paintings with some photographic elements. It’s a stirring tale, beautifully told. Ages 6-12.